As a dramatic actor, Mark Wahlberg has two modes. In militarized thrillers like Lone Survivor, where he played real-life Navy Seal Marcus Luttrell, or Shooter, where he portrayed totally fictional ex-Marine Bob Lee Swagger, he's a man of few words. His former underwear-model body, sharpened into a Ken-doll-shaped shiv, is the whole point. His other approach is more cerebral: Think of Jim Bennett, the monologue-prone literature professor from The Gambler, or Sgt. Sean Dignam, the boorish Boston cop from The Departed. In these movies, he can't shut up. 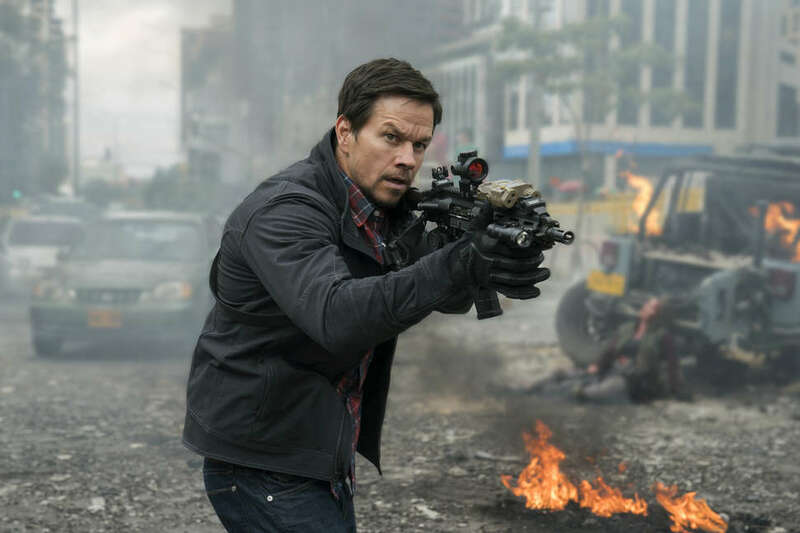 Meet option three: Mile 22, the fourth collaboration between Wahlberg and director Peter Berg, is an attempt to split, or at least blur, the Wahlberg-ian mind-body binary. The previous movies the pair made together -- Afghanistan war biopic Lone Survivor, oil disaster docudrama Deepwater Horizon, and Boston bombing recreation Patriots Day -- were somber, ripped-from-the-headlines portraits of Americans thrust into life-threatening situations, but Mile 22 adds a level of Hollywood hokum to the tactics-obsessed formula, attempting to kickstart a Bourne-like franchise for the 47-year-old star. It's Tom Clancy-style macho diplomacy riddled with Aaron Sorkin-ish attempts at verbal profundity. James Silva, Wahlberg's gun-toting black ops agent, has an attitude problem. He's prone to delivering pseudo-zingers like "ego is not your amigo" and quoting Donald Rumsfeld's "unknown knowns" speech, but he also antagonizes every member of his team of elite operatives -- code-named Overwatch -- by screaming at them, knocking over their breakfast plates, and, in one bizarre scene, straight-up calling them nerds. MMA-fighter-turned actress Ronda Rousey, The Walking Dead's Lauren Cohan, and Sesame Street's Carlo Alban play his irritated, overwhelmed co-workers. Presumably, the American government and the overseer of Overwatch, referred to as "Mother" (a flat-top-sporting John Malkovich), tolerate him because he's just, like, so good at his job. Most viewers will be less charitable in their evaluations. Even grading it on a curve as a right-wing paranoid fever dream, this is a loathsome movie. Berg, a filmmaker capable of effectively placing his roving camera in chaotic situations, has been freed to explore all his visual tics here, and the experience is numbing. In the opening sequence, he cuts between Russians in a suburban safe house, agents approaching the perimeter, Silva watching outside, and Malkovich's team at their desks while incorporating security camera footage, aerial drone photography, and shots of the characters' heart rates. If incoherence was the goal, well, mission accomplished. The movie slows down a bit as the script, penned by novelist Lea Carpenter, introduces its basic action movie plot. Indonesian police officer Li Noor (The Raid's Iko Uwais) surrenders at a U.S. embassy and has urgent, top secret information -- stored in his brain, of course -- that he will only give up in exchange for safe passage to America. Silva's Overwatch commandos are tasked with getting Li from point A to point B, a challenge that should be familiar to video game enthusiasts and lovers of movies starring WWE wrestlers. How far away is the airplane the team needs to get their asset to? Twenty-two miles, baby! This type of narrative simplicity would be refreshing if Mile 22 weren't so pleased with its glib analysis of the military industrial complex and thrilled by the brutality it portrays. Characters are constantly tossing up espionage true-isms like "an op is a living thing" and the script uses a framing device of having Silva reflect on the operation in a post-op interview, adding yet another layer of chin-stroking commentary to the action. The violence itself is bloody and ruthless. There's no end to the head-shots, eye-stabbings, and throat-slittings. Towards the end, a drone strike is carried out, blowing up a villain from the sky and letting our "hero" escape clean, and the desk-bound pilot literally chuckles with glee. Is this all a covert critique of a national security apparatus? For all their elaborate fist fights and lengthy car chases, the best Bourne movies also pushed the idea that the larger intelligence community was a vicious ring of pragmatic careerists, a vast conspiracy of power-hungry bureaucrats looking to save their own asses. Similarly, the ultra-violent Sicario movies can be read as indictments of the drug war. The filmmakers behind Mile 22 appear to have more mercenary goals: A sequel was announced before the movie underperformed at the box office. Fittingly, the film's twist ending, which I won't spoil here, doesn't resolve the movie's central conflict. It just lays out more runway for a plane that never really takes off. Should we blame the pilot? Wahlberg, who also serves as a producer here, has created a star vehicle for himself that lets him shoot people, save lives, and yell his head off. But by mixing his chatty energy and his man of action schtick, he's shot himself in the foot with his own comically large tactical rifle. Loaded up with a convoluted backstory, James Silva spends most of the movie snapping an elastic wristband to relieve his own stress. The pain keeps him mentally focused. Unfortunately, the pain of watching Mile 22 just leaves you exhausted.